A 19-year-old woman was raped while unconscious when she sleep-walked into the kitchen of a house. Jordan Adewale "preyed" on her in the early hours of 7 February 2017, Thames Valley Police said. The teenager woke up during the attack and alerted others at the property in Burnham, near Slough, before calling the police. 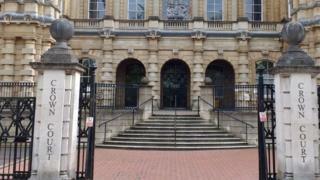 Adewale, 23, of The Greenway, Slough, was found guilty at Reading Crown Court following a five-day trial. Officers praised the woman for her "immense bravery" throughout the case. They said they had compiled "extensive forensic evidence" against the attacker. Det Con Richard Bazeley said Adewale "preyed on a sleeping victim for his own sexual gratification". Adewale will be sentenced on 26 April.